In March, the number one borough in terms of the total number of sales transactions were again Queens, who ended up with 35% of the total number of transactions for the past month. The borough saw a 2% increase in the total number of sales transaction in March compared to February. Manhattan beat Brooklyn by 1% this month, with 28% of the total number of sales transactions compared to Brooklyn’s 27%. Bronx didn’t see any change in the number of sales transactions for the month of March compared to February, as they still ended up with 10% of the total share of sales transactions. Looking at the median closing price for Manhattan for the month of March, we are seeing a slight increase in the closing price for the past month. In February, Manhattan had a median closing price of $1,152,500. In March, they had a median closing price of $1,237,500. That is an increase in median closing price of 7%. 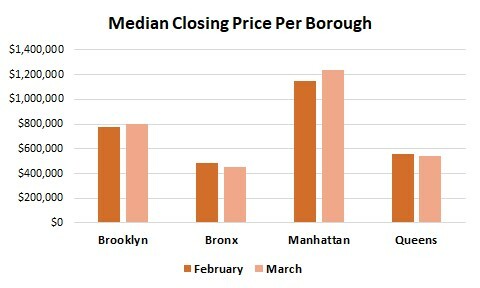 Brooklyn also saw an increase in the median closing price for March, by 3%. The median closing price went from $775,000 in February to $799,000 in March. Queens, however, did not see an increase in closing price in March. Instead, the borough saw a decrease in the median closing price by -3%. The closing price went from $560,000 in February to $541,900 in March. Bronx also saw a decrease in the median closing price in March and the decrease was more than half of the decrease Queens had. Bronx went from having a median closing price of $485,750 in February to $449,500 in March, which equals a -7% decrease in median closing price for the month. 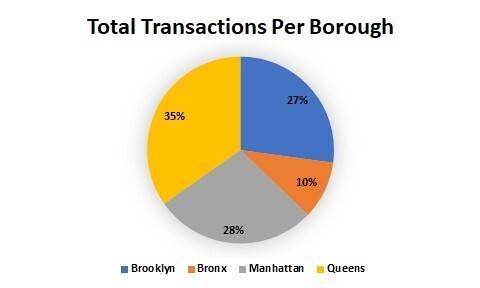 The table below shows the total transactions in March for the boroughs Manhattan, Brooklyn, Queens, and The Bronx. Obvious commercial transactions have been removed from the table (as well as any transactions that didn’t clearly show if it was a commercial transaction or not). The data in the table is provided by ACRIS for the month of March and ranks the transactions by the most expensive. We limited the transactions listed below to those of the cost of $100,000 and above. To search for transactions by borough, please refer to using the search field.